Go West, Viget. To Boulder, Colorado. In the past year we celebrated 10 years since we first opened our doors in DC, and 3 years since we opened our first remote doors in Durham, NC. The Durham experiment, AKA "Viget South," exceeded our expectations. We learned a lot about the benefits and pains associated with having two offices, and on the whole it's been great for us as a business and as individuals. If two is good, then three must be better -- especially if "three" is in Boulder, Colorado. 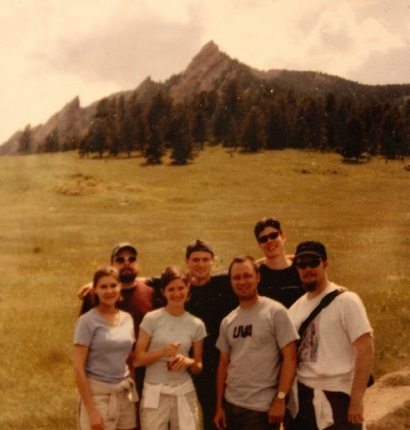 I lived in Boulder when we incorporated Viget back in 1999 (when the above photo was taken), but quickly moved back "home" to DC to get the business going. Ever since, it's been a bit of a company tradition to ask when we'll be opening an office there. We considered it back in 2007, but ultimately decided that Durham was a better location for our first remote office. Now that Durham is 15 folks and well established, we're ready to try a new experiment. Patrick Reagan and his adorable family piled in their covered wagon and struck out on an adventure. Today, Patrick is working from the Techstars Bunker while he gets acclimated to both the altitude and the local tech community. We're lucky to have lots of clients and friends there already, including Pivotal, Imulus, Graphic.ly, Slice of Lime, Quick Left, Foraker, Victors & Spoils, Squidoo (well, Gil anyway) and others. We'd love to meet more folks. So, what's the plan? We learned from experience to set some goals but go with the flow. We don't plan to get our own office space immediately, but over the next couple of years we hope to establish an office comparable to what we have in Durham today. For us, growth is not a goal, it’s the result of other initiatives going well -- things like finding and hiring great people, working with fun and challenging clients, growing our skills and reputation, and being active, supportive members of the communities we’re in. If you'd like to talk about helping us form our team in Boulder, please get in touch. We'd like to talk with project managers, developers, and designers who have exceptional talent and an entrepreneurial streak and want to be a part of a top Colorado digital agency. It's not just my personal love for Colorado that attracts us to Boulder. It's a great place to live, work, and build a team. In addition to our big-brand clients, we love working with start-ups and, even 10 years in, work a lot like a start-up ourselves -- so even though this is an "old" idea for us, all the recent press (Fast Company, Business Week, and New York Times all come to mind) encouraged us even more. We think Boulder is a Viget kind of town, and we're excited to be a part of the community.